Join Woodhorn for their annual Miner's Picnic. Entry is FREE (parking £3.50 or catch a free bus from Ashington bus station). Expect a jam-packed itinerary including music, street theatre, the Pitman Poets and a HUGE brass band performance with over 300 players. Join artist Paul Merrick with his Fab Zoom craft area where you can recreate treats from yesteryear (mini milk anyone?) 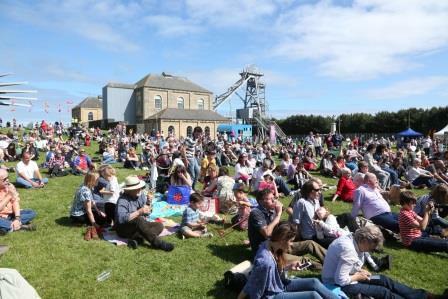 and help artist Bethan Maddens create a growing installation of Little Woodhorn. This action packed event from Time and Tide Events with FREE entry is not to be missed. There's so much going including a Medieval doctor, storytelling, Pottery deomonstrations, Wandering Minstrel and Buffoon, Birds of Prey, Witch Fruit Trails and more. There will be handcrafted goods, street food, food stalls and refreshments for sale too. In celebration of the Queen's 90th birthday, Mister Ridley's at Ridley Park is hosting a right Royal get together. Expect live music, face painting, balloon making, giant inflatables and delicious homemade lunches, ice creams and cakes. The water park will be in operation too so don't forget your costume! Expect an action packed day as Morpeth is transformed for the day. There is so much going on including Turners Fun Fair, Vintage Cars, Food Court, Fun Run, Parade and more. A FREE park and ride will be operating from County Hall and Morpeth Town AFC will be celebrating their FA Vase victory in an open top bus as part of the parade at noon. This event is free however usual entry fees to Gibside apply. Join the Gibside rangers in the walled garden and help them identify the different types of moths that have been discovered through the night as part of National Moth Surveying Night plus find out why moths are so important. I love this idea of Friday fives! 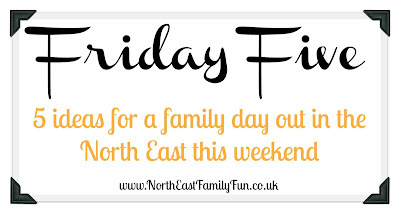 As a busy working mam I always struggle to find out what's going on before the weekend arrives and this really helps!